When I started this site, I really only knew a small group of food bloggers, and nearly all of them are located in or very near Boston. 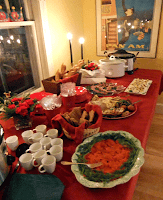 Turns out there are a whole lot of wonderful bloggers in other parts of the state as well, and some of our North Shore friends got together for a lovely holiday potluck. This event recap is BostonFoodBloggers.com's very first guest post! Yay! It was written by Heather Atwood, Food Editor for the Gloucester Times and author of the blog Food For Thought. Thanks Heather! 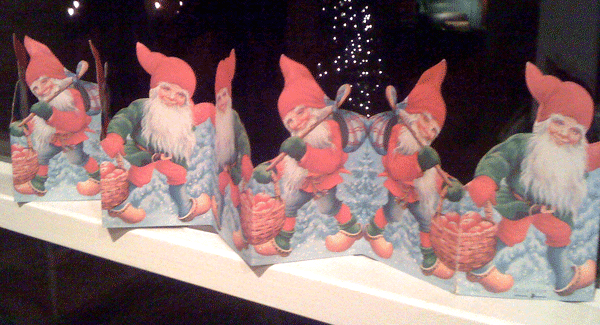 Imagine this: A blind date at a Food Network holiday-potluck-throw-down. You don’t know anyone, you have to bring a dish, and everyone’s a chef. And it’s Santa Lucia Day. That’s the best way to describe the Saturday evening gathering of North Shore bloggers hosted by Kristen of North Shore Dish. Most of us knew each other only from our avatars and blogs, and we all had to bring something to eat. Yes, the majority of us were FOOD BLOGGERS, all having to prepare food for other food bloggers, whom we didn’t know. No pressure there. 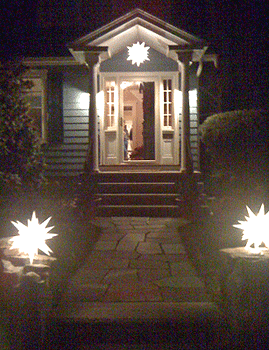 The St. Lucia part was Kristen’s beautiful Swedish-appointed Marblehead home: no reindeer and flashing lights for her, single stars glowed outside on Kristen’s stone wall, a warm, iconically minimal, Scandinavian welcome. Inside, a fire blazed in the fireplace and the Christmas tree sparkled, the right calming medicine for our “blind date” first moments, looking around trying to attach blog style to haircut, bold tweets to shy party personality. I’m sure I said stupid things like that. Happily, where there are food bloggers there are also good things to drink. Even more happily, food bloggers - almost by definition - eat, drink, and are merry almost anywhere. It didn’t take long for Isaak of Salem’s Honey Wine to get passed around, along with other beverages, and for everyone to cozy in together on Kristen’s enormous couches and feel like old friends. It was like Oscar night for FOOD. Truly, I soon felt as if these blog and twitter stars – Brian of The Gringo Chapin, Seth of Lynn Happens, Kimmy of Lighter and Local – and I were old pals. (It didn’t hurt that Brian had brought me a bottle of his friend, Pepe’s, family olive oil.) Kimmy, I want to have lunch with regularly. (Can we?) 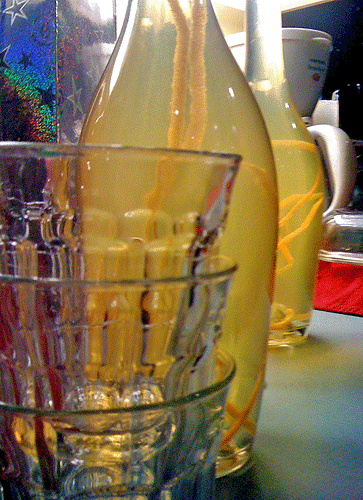 Who knew Kristen’s partner, Phil, made such great homemade wine? Corey Jackson, from Downtown Lynn, brought a platter, like a knight bearing his noble’s coat of arms, representing Lynn’s very happening restaurant, The Blue Ox: Warm mushroom and artichoke bruschetta with caramelized onion and goat cheese. Baked stuffed brie. Apricots, figs, cranberries and white truffle oil crostini. Squash and duck arancini. Just what you expect from Lynn, right? 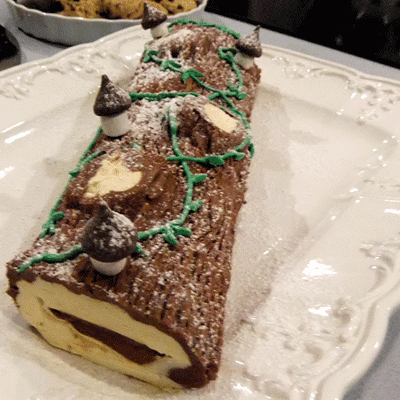 Jill, the other side of North Shore Dish, proved her skills with genoise; her buche de noel, dotted with frosting mushrooms, was log-perfect. party going. Unstoppable in the kitchen, she also contributed rustic breads, beautiful deviled eggs and cookies, too. The word on the street is that Mary is finally coming in from the cold Newburyport Farmer’s Market and opening her own restaurant, Enzo, right there in The Tannery. I’m guessing our blogger party will be one of the first reservations. Mary’s husband, whom it was a pleasure getting to know, will be meeting us at the door. 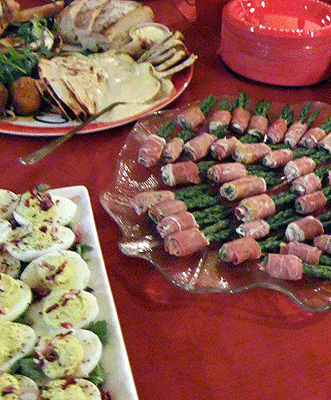 Of course, Kristen prepared the obligatory Swedish meatballs as well as bite-sized prosciutto and asparagus bundles. Brian also brought meatballs, and true to the Guatemalan focus of his blog, these party favorites were the hearty tortitas which he had blogged about in September. 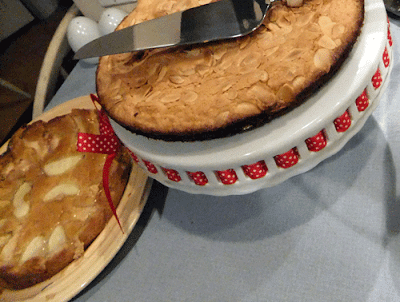 Kimmy Bingham made both an almond tart and a beautifully homey looking apple cake which turned out to be a Dorie Greenspan recipe. 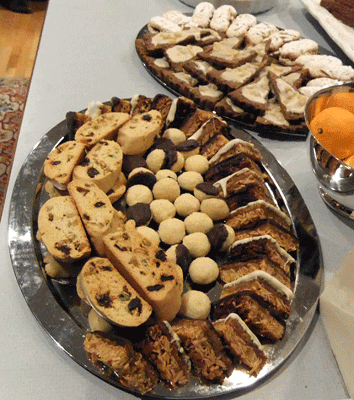 You can read Kimmy’s blog post about it here: Dorie Greenspan's Swedish Apple Cake and a Holiday Potluck. I have to confess, my appetite began to pale after two servings of the Syllabub, prepared by Rob and Laura of The Two Palaverers. The 500-year-old recipe of sherry, reisling and whipped cream felt like the perfect food - alcohol delivered by cloud. So old fashioned she's new, Sarah of The Roving Home prepared a platter of buttermilk cheese with spiced figs sauce. She was happy to share the recipe with us, which originated with the Lee brothers. My contribution was easy: conveniently, I corralled my husband to make gravlax, something he’d mastered before, which fit the Swedish theme, and coyly excused me from the performance anxiety of cooking for this room full of blogging, twittering, cooking greats. Lay a piece of plastic wrap in a glass dish large enough to hold the salmon sides. Lay one side, skin side down, on the plastic wrap. Mix the salt, sugar, and crushed peppercorns and spread half this cure mix over the surface of the fillet. Lay the whole bunches of dill over the salt. Sprinkle the Aquavit or vodka over the dill. Spread the rest of the cure mix over the dill and lay the second side of salmon skin side up, over the first. Pull the plastic wrap up to cover the fillets. Place another dish or some plates on top of the salmon and weigh it down using canned food or other heavy items. Place the dish in the refrigerator for 48 - 72 hours. Once or twice a day remove the dish, unwrap the salmon and baste it with the juices that accumulate. Then flip the fish over and return the dish to the refrigerator. 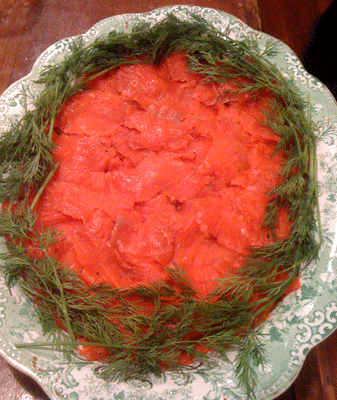 Take the fillets from their wrapping, remove the dill and scrape off any excess cure mix. Slice thinly on the bias and serve. Line a colander or a medium strainer with three layers of 12-inch cheesecloth squares and set in sink. Combine ingredients in a large heavy-bottomed pot over medium-high heat and cook until mixture reaches about 180 degrees F and separates into white curds and translucent whey, about 8 minutes. Ladle contents into prepared colander and drain completely. Gather corners of cheesecloth together and gently twist to press out excess whey. Serve immediately, or cool to room temperature before serving, about 10 minutes. For firmer consistency, transfer cheese, still in cloth, to a small flat-bottomed plate and let stand in refrigerator until cool, about 10 minutes. Unwrap and gently invert onto plate, discard cloth, and tent cheese with plastic wrap. Chill until 10 minutes before serving. Add toppings: Spiced Figs, Pickled Fennel, or Pistachio Crust. Cheese will keep for up to 2 days. Bring ingredients to simmer in a small saucepan over medium-high heat. Reduce heat to maintain a simmer and cook until liquid is reduced by three-fourths and syrupy, about 10 minutes. Cool to room temperature; discard bay leaf. To serve, spoon figs and syrup over a round of Buttermilk Fresh Cheese. Cut stalks from asparagus, leaving 2-inch-long tips. (Reserve asparagus stalks for another use; see note in recipe introduction.) Cook asparagus tips in large pot of boiling salted water until just crisp-tender, about 1 minute. Drain. Transfer asparagus to paper towels and drain well. I am disappointed not to see Isaaks of Salem not mentioned, however we had a great time at the party and look forward to sharing in more events like this! Happy Holidays!